"Fermi and astrophysics" is a book published to celebrate the 100th anniversary of Enrico Fermi's birth. 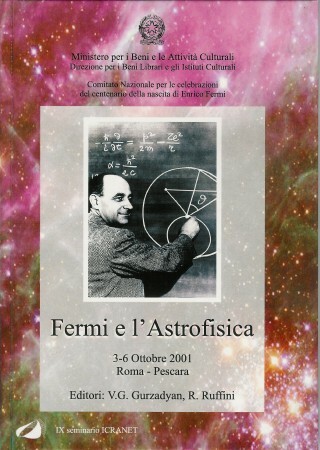 From October 3 to 7 of 2001, in Pescara there has been a meeting about scientific developments in astrophysics influenced by Fermi’s seminal ideas. This book collects papers from that meeting, as well as the original Fermi's papers that have been the basis of the talks. Full English translations of original Fermi's papers.